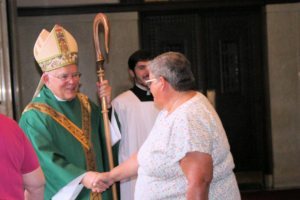 Well, Archbishop Chaput, at a lecture he was giving in Manhattan (imagine how many people like us were there) “blasts Vatican debate on family, says ‘confusion is of the devil””. Now when you read this article, I started to wonder if Archbishop Chaput really wants Pope Francis to come here. I have personally heard him speak about how “concerned” and worried Catholics are because of Pope Francis – his words and his actions. He most definitely seems to be speaking for himself. Yet this article should not be a surprise to us as there can be not debate, no discussion with the Archbishop about anything. Does he think his style and words are drawing people back to the church? Is he even helping to keep people in the church? I get concerned about people who always think they’re right. I’m concerned about our local Shepherd telling us “the decision has been made and we are not considering any changes”. Are you as concerned as I? You decide after reading – “Archbishop Chaput blasts Vatican debate on family, says ‘confusion is of the devil'” Thanks to Greg Minetola for sharing this article. Thank God for Pope Francis. A light and a beacon that tells us it’s alright to have these discussions. He’s another opener of doors like Pope St. John XXIII. Let’s talk about it – let’s see how we can heal those whose lives have already been broken by society, by the loss of a love intended to be forever through divorce and anyone who feels a distance from Jesus’ love. 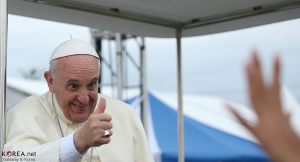 Pope Francis is not about “winning” or dictating. He’s about making visible the kingdom of heaven on earth. How different than what we’re used to. Pope Francis, himself, is an expression of unity and of bringing all of us together. Here’s a summary of the Synod from the National Catholic Reporter. “Synod a win for Franics and openness”. I’m glad ours is a church of diversity and expression of that. But we mustn’t let fear or judgement be our guide. We must have the courage of the Holy Spirit! It confirms what we believe. It is even more imperative and necessary that each and every Catholic add their voice to these discussions. Are you willing? Can you believe?